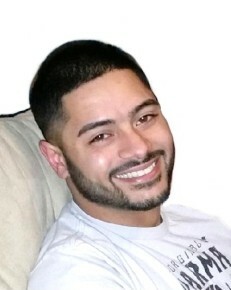 ANDOVER- Andre A. Garcia, Jr., 25, of Andover, died unexpectedly on Monday, August 27, 2018 at his residence. He was born in Methuen on July 3, 1993, attended Methuen schools, and was a graduate of Methuen High School. He was employed at Maple Leaf Tree Service, which is owned by his uncle, Carl Beauregard, who was a great mentor to him. Andre was a proud veteran of the U.S. Army and served overseas for SETAF, where he was selected to give the non-commissioned Officer's induction speech for the recipient of the Army Commendation Medal in Vincenza, Italy. He also served as Platoon Leader, Squad Leader and AIT Barracks Leader. He also ranked highest in his platoon for marksmanship. He was the recipient of the National Defense Service Medal, the Global War on Terrorism Medal, the Army Service Ribbon and the Overseas Service Ribbon. He was honorably discharged as a Private 1st Class and was an IT Specialist. He was an avid Boston sports fan. He enjoyed fishing, hiking, skateboarding, playing airsoft guns and playing poker with his very close friends Matt Gregg of Methuen, Steve Roberge and Sophia Giordano of Malden, and also his very close friend, Chelsea Robichaud of Methuen. Andre is survived by his parents, Pamela (Lister) and Andre Garcia, Sr. of Andover; his siblings, Crystal Mannion of Methuen, Chazrik Lister and his wife, Mallory of Andover, and Jasmine Garcia of Malden. Also among his survivors are his paternal grandparents, Julia and Adolfo Casado of Lawrence; and his three nephews, Godson Lennon Lister, Arden Lister, and Tye Hamelin. He was also the grandson of his late maternal grandparents the Gordon and Palma Lister of Lawrence. Family and friends may call on Tuesday, September 4, 2018 from 4-8 PM at Cataudella Funeral Home, 126 Pleasant Valley Street in Methuen. A funeral service will be offered on Wednesday, September 5, 2018 at 10 AM at the funeral home. Burial with military honors will follow in the veteran section at St. Mary’s Immaculate Conception Cemetery in Lawrence.